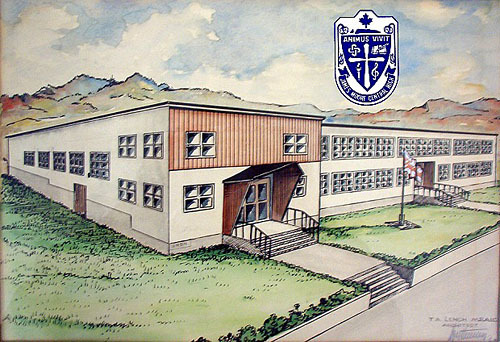 This "old school" website is a free resource for former students, faculty and staff of James Moore Central High School (known as James Moore Regional High before 1974, and United Church Regional High before 1967) in Carbonear, Newfoundland, Canada. It's a growing collection of photographs, yearbook entries, history and memories from our school (and nearby St. James Junior High) which was built in 1960 and torn down in 1985, after producing well over 1000 graduates. Check back frequently as new information is constantly being added. The JMCH Website needs your help! We're running out of new content, and need your input to keep growing. Please fill out the Alumni Survey, register on the Discussion Forums or sign the Guestbook, and join in with your memories. Don't forget to spread the word to other graduates you know too! Wanted! Any JMCH souvenirs, mementos, memorabilia, artifacts, yearbooks, photographs, artwork, historical documents, awards, student newspapers, programmes, tickets, audio/video tapes, graduation themes, mottoes, slogans, mascots, press articles, teaching materials, textbooks, exams, stories, trivia, etc. If you have any information to contribute to the site, please contact the webmaster or leave an entry in the guestbook, and don't forget to fill out our Alumni Survey. I will gladly scan, photograph or copy and return any contributed items, insured and free of charge. Information about any students, faculty or staff who have passed away is also appreciated for our In Memoriam page. Do you have a website about a Class Reunion? Join Now! This website is designed to be viewed at a screen resolution of at least 800x600 with 16-bit color. The latest versions of Mozilla Firefox, Google Chrome or Microsoft Internet Explorer web browsers are recommended. Disclaimer: This is an unofficial, non-profit, advertisement-free, no-charge, independent, volunteer website run by a former JMCH student. It was not created by, nor is it approved, supported, or maintained by, the Eastern School District or any of its schools or past/present staff members.